TOKYO — Toyota Motor Corp. will offer free access to its hybrid vehicle patents through 2030, seeking to expand use of the lower-emission technology even as the global industry shifts towards fully electric cars. The pledge on Wednesday by one of the world's biggest automakers to share its closely guarded patents, the second time it has opened up a technology, is aimed at driving industry uptake of hybrids and fending off the challenge of battery electric vehicles. Toyota said it would grant licenses on nearly 24,000 patents on technologies used in its Prius, the world's first mass-produced green car, and offer to supply competitors with components including motors, power converters and batteries used in its lower-emissions vehicles. "We want to contribute to an increase in take up [of electric cars] by offering not just our technology but our existing parts and systems to other vehicle makers." Terashi said that the access excluded patents on its lithium ion battery technology. Toyota's move to unlock its patents underlines its belief that hybrids are an effective alternative to EVs, given a fuel efficiency roughly double that of gasoline cars, lower cost and that they do not need charging infrastructure. 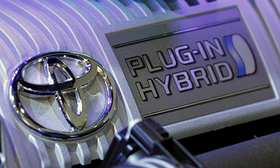 "Toyota has realized that they made a mistake by protecting their hybrid technology for years. This prevented diffusion" said Janet Lewis, head of Asia transportation research at Macquarie Securities. Since pioneering the Prius in 1997, Toyota has sold more than 13 million hybrids, which pair a conventional gasoline engine and electric motor, saving fuel by capturing energy during coasting and breaking and using it to power the motor. Hybrid vehicles account for around 3 percent of all vehicles sold globally, eclipsing the roughly 1.5 percent share of EVs, according to LMC Automotive. Toyota is also betting on hydrogen fuel cell vehicles as the ultimate zero-emissions vehicle, and as a result, has lagged many of its rivals in marketing all-battery EVs.